Allows any three-point harrow to be towed. Each tow bar is equipped with a 2-inch ball hitch or pinhitch. 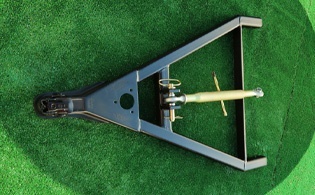 The turnbuckle, which connects the tow bar to the uppermost neck of the harrow, provides adjustments to the s-tines and the float pan to allow a clean ring exit. *Note: with the float pan lowered, twoed harrows do not reverse until the spring tines and tips are first raised from footing.